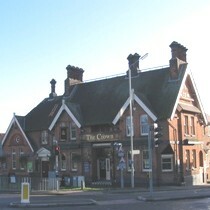 The Crown in St Albans is a large pub on the corner of Hatfield Road and Clarence Road, less than five minutes walk from the mainline train station. It used to be a popular place to go to watch sport and have a pub meal but recently it's popularity has dropped. At the time of the review, around 10pm on a Thursday, there were less than twenty other people in the pub. The large area to the left of the entrance has two pool tables and a plasma screen whilst the others areas have traditional pub tables, bar stools and seats. As the Crown has a projector and multiple plasma screens this is a good place to watch the football. Charles Wells Bombardier and IPA are the two ales available on handpump. Thursday night is quiz night whilst Karaoke takes place on a Friday. Judging by the small amount of people participating in the quiz night I'm not sure why they bother and Karaoke on a Friday is hardly likely to pull in the punters in a place like St Albans. This place desperately needs a change of ownership and direction because a large pub like The Crown cannot carry on with so few people willing to drink in there. Apparantly the lease is up for sale so let's hope someone takes over and gets this pub back to the popular place that it used to be. To be avoided until a change of ownership. New landlord and apparently the pub is much improved.